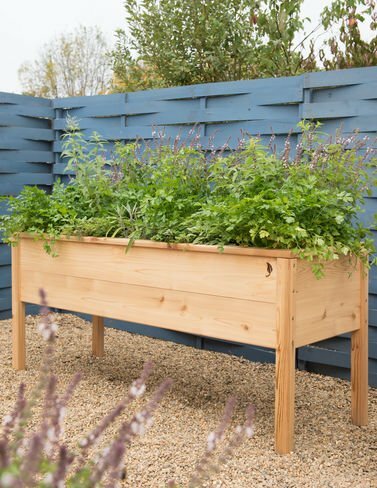 The larger of our exclusive CedarLast elevated garden boxes, this handsome planter has an ample 13" planting depth so you can grow a diverse vegetable, herb, or flower garden - use our free Kitchen Garden Planner tool to create your custom plan, or try one of ours!Reminiscent of Mission-style furniture, sturdy construction sets this apart from other planter boxes. Built from solid Western red cedar, with time-tested mortise-and-tenon joints, it's designed for years of use. Pair with the 6' CedarLast Trellis, sold separately, for vining flowers and vegetables. Let the cedar weather naturally to silver, or protect it with our food-safe Clear Waterproofer.